A compact new-build contemporary Passive House project for private clients in Richmond, Surrey, creating a 3-bedroom house at the end of a street of traditional Victorian terraced houses and villas. The design was carefully crafted and cantilevered over the side-road to achieve more than would have been thought possible for this tiny site; an intriguing house with wonderful daylighting. This would have been Richmond’s first Certified Passive House, and the proposal added green space through deep planters and a native wild flower meadow roof to contribute in its small way to the microclimate and local ecology. The proposal included integrated bird and bat boxes, rainwater harvesting, solar collectors and provision for on-site electrical energy generation with a PV array and automatic solar blinds on south and eastern facades. 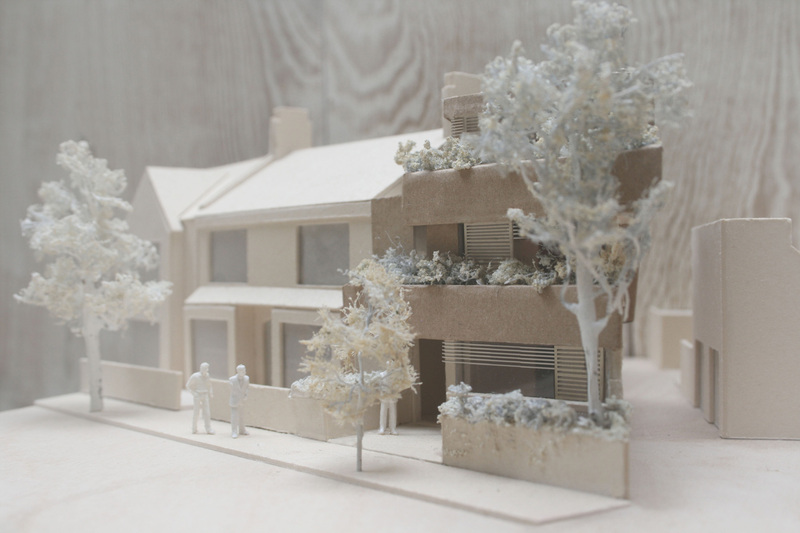 The project received a positive pre-app response initially, but Richmond Council introduced a blanket ban on modern architecture, brought in under the powers granted to local authorities by Prime Minister Cameron’s ‘Localism’ bill. Although the eco-credentials were strongly supported by the local MP, Zac Goldsmith, the project had to be abandoned and the site was developed under an existing approval for a low-cost commercial development.